So, now that you know for a fact that your tank is actually leaking, what’s your next step, you may ask. If you’re not a hundred percent positive that your tank is leaking, I suggest that you go ahead and check another blog post on this site that explains how to confirm a hundred percent that your tank is leaking. Often times tank leaks can be coming from other areas. They can be coming from underneath the tank, they can be coming from other sources, they can be pressure-relief valve problems or a variety of other things. So, the first step is confirming that your tank is leaking. If you know for sure that the tank is leaking, then first and foremost you’re going to want to get the water shut off. There are a couple of different options for this. The first spot that you want to check is on the cold water line above the tank. On the top of the tank, it actually might indicate and it might say hot and cold. If you put your hand on the pipe that says “cold” and you follow that pipe up, you will most likely find a small shut off – either a lever or a knob to screw in, or some sort of device that will stop the water from going into the tank. Word of warning at this point – often times, those knobs that shut off the water into the tank are not working and you can’t always tell if they are actually fully stopping the water. The problem is the fact that if the water is still flowing into the tank but you think it isn’t because it’s off, and the water from the bottom of the tank is flowing onto somewhere in your house that does not have a proper drain, you can have damage to your home. So, the next spot that you’ll want to check is where the main water comes from into your home. This can often times be found near the tank (for example a pipe coming out of the floor), and it has a similar shut off mechanism to shut the tank off. Sometimes this mechanism needs to be screwed down to the bottom, or a lever must be turned perpendicular to the pipe to shut it off. It all depends on your model. 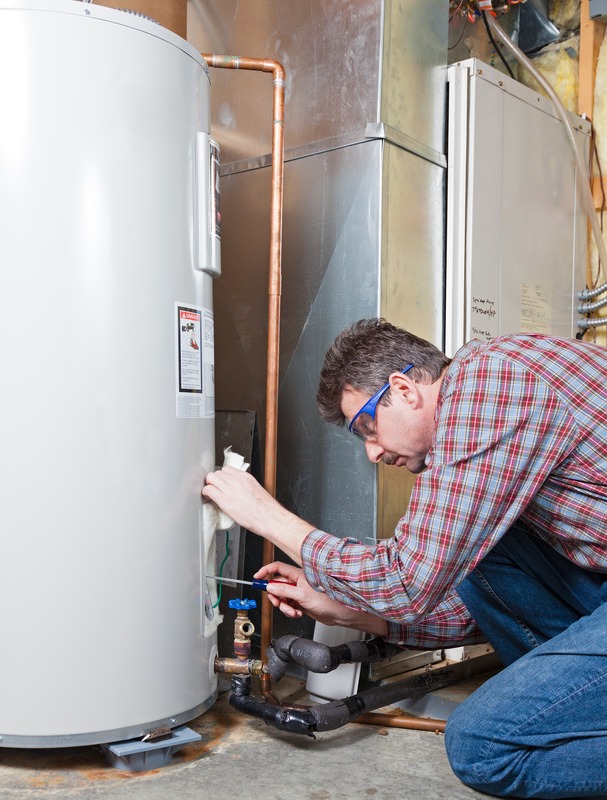 A lot of the times, the main water shut off for your home is in very inconvenient locations, like the back of a crawl space, the back of a closet, behind the furnace, behind the hot water tank, and sometimes it’s extremely difficult to access. If the tank can’t be shut off from above the tank and let’s say you can’t find the main water shut off for your house, then in that case the only other option that you have is to shut your house’s main water off, which can be quite inconvenient. It usually requires a plumber because it usually requires special tools. The plumber would need to go with a key somewhere on your front lawn or driveway and find a small access. If the original access for your water has been buried or damaged, then it usually involves someone from the city having to come out and either dig up your front lawn to find it or shut it off at an even further point. So, the preferred option is to shut it off at the tank and go from there. The first is at the tank itself. There is a small button or knob on the top – that says ON, PILOT and OFF. It would be pointing to the ON position. Turn that around until it goes to the OFF position. Following the gas pipe back, that connects to that gas valve, you should see another shut off, with likely a lever that turns perpendicular to the pipe to shut the gas off. The other option is shutting the gas off at the meter, which usually requires a present wrench. But it’s something that you should be familiar with by now. Contact your gas utility provider for instructions at how to shut that off. Last but not least, you want to drain the hot water tank. One small addendum to this post – sometimes, people don’t have gas water heaters and instead they have electric water heaters. So, there won’t be any gas to shut off and instead you’re going to want to go to your breaker panel in your house. Find the breaker marked “water heater” and shut that off. A lot of the times the breakers can be marked wrong, so you’re going to want to call a professional on this point, to make sure that everything is shut down correctly, and get the tank swapped out. A really common thing that people wonder about is whether they should replace their furnace, or just repair it. The most common..
Something that people ask about quite often is “are there some basic things that we can do to see if we can fix the air conditio..